Now Camille Cosby is in the cross-hairs of a new lawsuit filed by one of her husband BIll Cosby’s accusers. Renita Chaney Hill, a Pittsburgh woman who as a teenager was on an educational children’s TV show with Cosby in the 1980s, filed suit Thursday against Cosby, making it the sixth lawsuit against him — and the third alleging defamation — arising from accusations that he drugged and raped more than 50 women in encounters dating back decades. 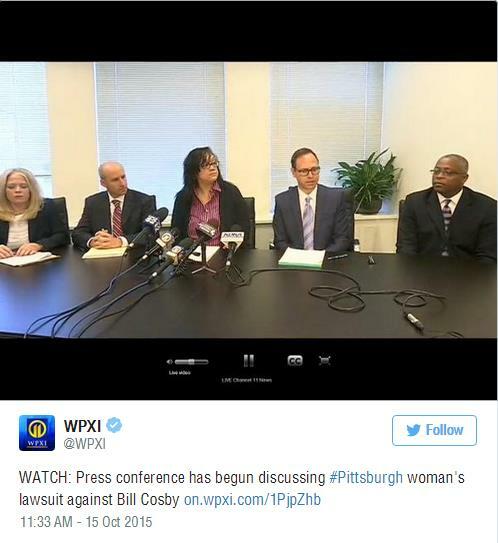 Hill’s lawsuit, filed in state court in Pittsburgh, alleges that Cosby, his wife of 51 years, and his Los Angeles lawyer, Martin Singer, defamed her, placed her in a “false light” through “retaliatory statements,” and intentionally inflicted emotional distress after she went public in November 2014 to join the chorus of accusers coming forward after the allegations re-surfaced a few months before. 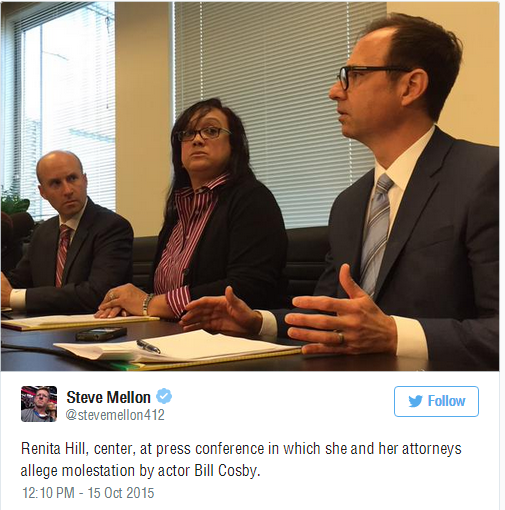 “Based on our investigation of the law, we believe the claims we put together are those that have the greatest chance of allowing Renita Hill to obtain justice for what happened to her at the hands of Bill Cosby,” said one of her lawyers, George Kontos, shortly before holding a press conference to discuss the case. “The filing of this lawsuit is one more step toward seeking justice for what happened to me and in holding Bill Cosby accountable for the false allegations that he’s made against me,” Hill said at the press conference, during which she was accompanied by her husband and two daughters. “Renita subsequently woke up naked in her hotel room the next day,” her suit says. She said nothing about these encounters at the time, because she was just a teenager and was too intimidated to point a finger at “the most powerful TV entertainer at the time,” says Kontos. But when the accusations against Cosby began to re-emerge in the fall of 2014, she came forward with her own story in an interview with a local TV station. That’s when she says Cosby, his wife and his legal team “retaliated” against her with allegedly defamatory statements, even though they did not mention her or any accuser by name. But when the accusations resurfaced last year, Cosby and his lawyers at first forcefully denied them, calling them “innuendos,” “unsubstantiated, fantastical” and “absurd,” and suggested that accusers were after money from Cosby. 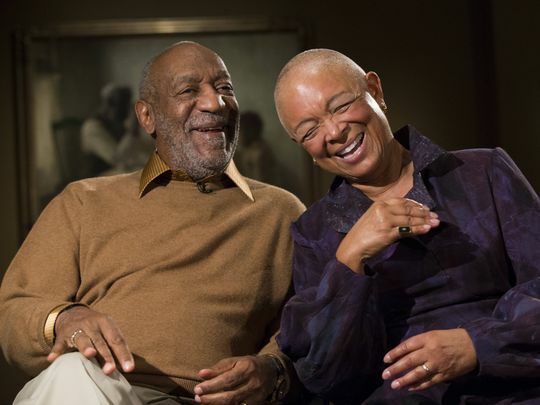 Camille Cosby has made only one statement about the accusations against her husband, in December 2014, when she questioned the credibility of the accusers and criticized the media for not doing anything to “vet” their stories. As a result, Hill’s lawsuit says, Cosby, Singer and Camille defamed her by making “false” statements denying he did anything wrong. Hill says their statements were intended to paint Hill and other accusers as liars and extortionists. She says she was offended, her reputation was harmed and she suffered emotional pain. 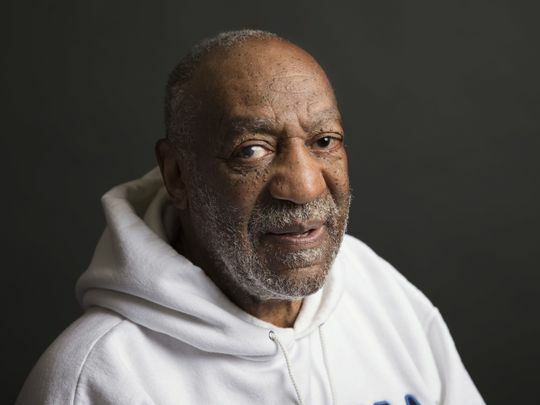 Hill seeks unspecified damages stemming from both the alleged abuse and Cosby’s denials. Of the more than 50 accusers who have come forward in various public forums since last year, four have sued him (in two separate lawsuits) for defamation. Only one woman’s accusations are being considered for criminal charges, in Los Angeles, because most of the alleged encounters took place too long ago under statutes of limitation. Two other civil suits accuse him of sexual assault and sexual battery. Last week, Cosby was deposed for one of those suits, by accuser Judy Huth in California. The deposition has been sealed at least until Dec. 22, but Huth’s lawyer, Gloria Allred, who represents dozens of Cosby accusers, says she wants to ask him more questions in another deposition. Meanwhile, on Thursday two more colleges rescinded honorary degrees given to Cosby. Tufts University in Medford, Mass., says it withdrew an honorary doctorate of arts it conferred on Cosby in 2000, along with an award given in 2011 for excellence in children’s media. The university said Cosby has shown “a lack of character and integrity” that does not represent the school’s values. And Baltimore’s Goucher College says it decided to revoke an honorary degree it gave to Cosby when he was commencement speaker in 2001. These moves came one day after Pennsylvania’s Lehigh University announced it had rescinded an honorary degree given to Cosby in 2005.